More than Ever, Hope Prevails! I am just giddy with joy as today I have some exciting news to share with you! Has God ever given you a dream and then allowed it to be birthed from your heart? That happened to me a year ago, when my dream of having a resource that could extend beyond the four walls of my private practice was published. 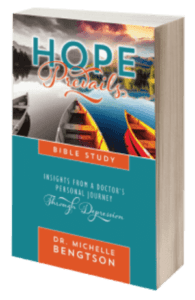 On August 16, 2016, Revell publishers released “Hope Prevails: Insights From a Doctor’s Personal Journey Through Depression,” a true dream come true for me. For 20 years I treated patients with depression as a board certified clinical neuropsychologist. Yet when I fell prey to the ravages of depression myself, I tried all the treatment suggestions I had given to my patients for years. They helped but were insufficient to completely eradicate the problem. Only when I addressed the spiritual root of depression, were the chains of depression broken and freedom found. Hope Prevails was written from a dual perspective: that of a board certified clinical neuropsychologist with 25 years of clinical expertise, but also as a depression survivor who can speak from personal experience. Almost every Amazon review positively comments on this unique perspective. Every chapter includes a prayer for the reader, a recommended playlist of praise and worship music, and a homework prescription to apply the principles of the chapter. Since the release of Hope Prevails, readers from around the world have written and thanked me for authentically and transparently sharing my story to give hope, and share with them the comfort that I was given. But that’s not all. Many also asked when I would write a companion Bible study. I argued with God, “I don’t write Bible studies. I’m not Beth Moore or Priscilla Shirer.” God’s response to me? 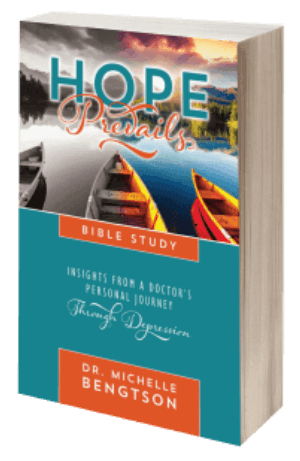 “You may not write Bible studies, but I do.” So a little over a year later, in response to reader requests, I’m excited to announce that on October 25, 2017 the “Hope Prevails: Insights From a Doctor’s Personal Journey Through Depression Bible Study” will be released! The study was intentionally written so that it could be used either as a companion to Hope Prevails, or as a stand alone study. It was also intentionally written so that it could be studied individually or in a small group study such as a small group Bible study, counseling center group study, or neighborhood study. It includes questions for reflection, key thoughts, music playlist suggestions, resources, plus a leader’s guide. Announcing the October 25, 2017 release date of #HopePrevailsBibleStudy! As of October 25, 2017 it will be available on Amazon, Redemption-Press.com and most major book retailers. And as if that wasn’t exciting enough, I have a second piece of exciting news to share with you! 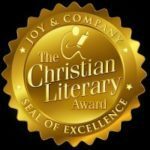 “Hope Prevails: Insights From a Doctor’s Personal Journey Through Depression” has been nominated in the nonfiction category for the prestigious Henri award by the Christian Literary Awards! Voting is now open. If you have been positively touched by Hope Prevails or my ministry, or you want others to know about this resource for hope for depression, here is a chance for you to show your support and vote for “Hope Prevails” to win in the nonfiction category. Go to www.joyandcompany.org, then click on the medallion for the category you want to place your vote (nonfiction), then vote for “Hope Prevails” and hit submit. You are allowed to vote one time per device (phone, iPad, computer, etc). Thanks so much for helping to spread the message of hope to a hurting world. Hooray! This will be a great help and encouragement to many. So excited for you! And thanks for putting the power of God on display as you allowed Him to work through you! Yay! So excited for you and the study! Congratulations! Love and hugs!